An exclusive sneak peak of the latest Gypsy Rose Vintage a/w 2018 collection! A fun collaboration with GVR, Make You Up Ltd, Free The Tribe Photography and The White Room Floral in our local woodlands. For this shoot we created a beautiful eco friendly organic silk wedding dress which was teamed with a leather jackets for a rock n roll bride look. 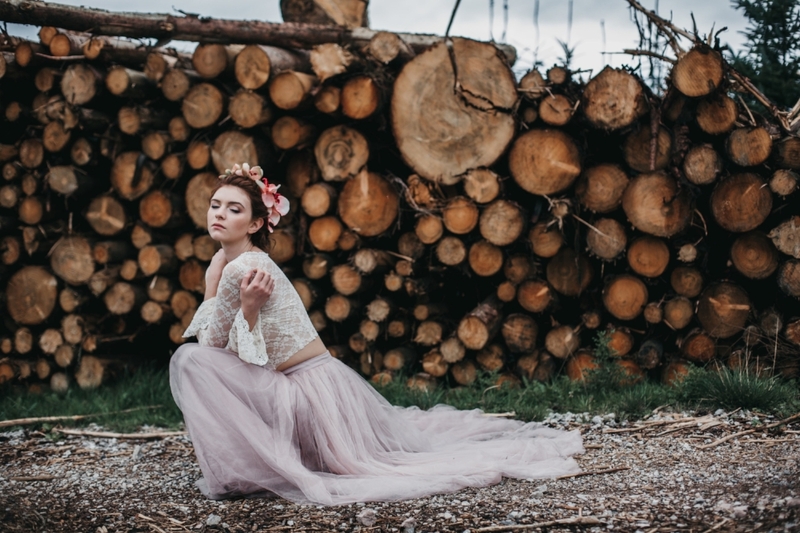 Our sheer lace topper, created specially for this shoot was worn with a pink tulle skirt and boots for a bold bridal look. We just love the way this silk moves and drapes. It is so light and flattering. Watch this space for future collections featuring this silk! Latest news, exclusive offers and stylish inspiration. If you are local to Macclesfield this location (Macclesfield Forest) is a great location for a pre-wedding or engagement photoshoot.